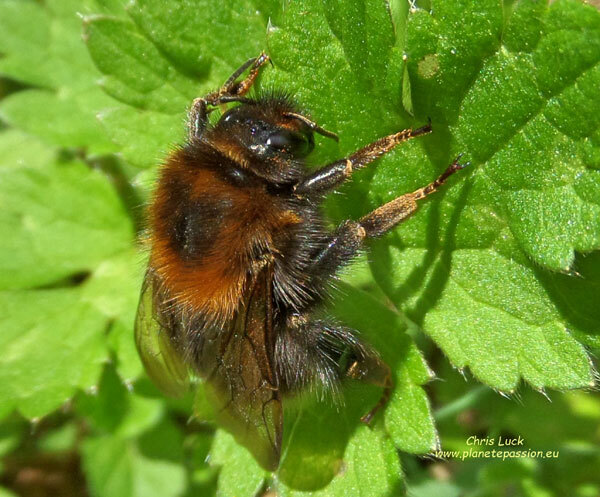 All we really need to know if we are to help Bumble bees is what they look for in a nest site and what they require in their immediate surroundings. Most, but not all, prefer dry, dark cavities to make their nests in which can turn up in a variety of unexpected places. Some nest underground, in places such as abandoned rodent holes, under sheds and even in compost heaps. Of those that nest above ground, some make nests in thick grass, while others make nests in hollow trees, bird boxes, roof spaces and cavities in stone walls. Then as it’s likely that many people will already have a place or places for some species to nest all that is needed is to leave any nest alone. If it is in your outside wall, your roof or an old rodent hole in an outbuilding they will do no harm and are extremely unlikely to sting unless seriously provoked. If you should have a nest in an open space such as a vole hole then if you could avoid interfering with the entrance by not moving objects or mowing. Just leaving a small area, say about 30cm all round, would be great as it’s now thought that roadside verge cutting is destroying a large number of nests by covering up their entrances creating more pressure on populations combined with expanding arable agriculture. Providing sufficient appropriate flowers for forage close by is also extremely important as we shall see. Look out for Queens in spring searching for a nest site. When searching for a nest site Queens will investigate the environment using both sight and smell making continuous distinctive zig zag flights. When she finds a potentially suitable site she will investigate by going into the hole and should this prove unsuitable she will continue searching until she finds a nest site that is which can be a very time consuming task. Having found a suitable location the Queen will forage for pollen and nectar to supply both herself and the initial brood she is about to raise. She then builds a wax honey pot and fills it with regurgitated nectar and at the same time constructs a ball made from pollen and nectar within reach where she lays a batch of eggs and covers them with wax. This enables her to sip from the nectar pot whilst keeping the initial eggs / larvae warm which she does by twitching or trembling her muscles maintaining a temperature close to 30°C. After about 4 days the eggs hatch into tiny larvae that require feeding with pollen and nectar that the Queen must keep fetching from flowers keeping flights as short as possible as the nest temperature must be maintained. After about two weeks when the larvae have grown they spin a cocoon and gradually develop into adult bees over the following 2 weeks. The Queen will usually lay another batch of eggs while the first batch are still in the larval stage. After the emergence of the first or second group of bees the workers take over the task of foraging and the queen spends most of her time laying eggs and caring for larvae. 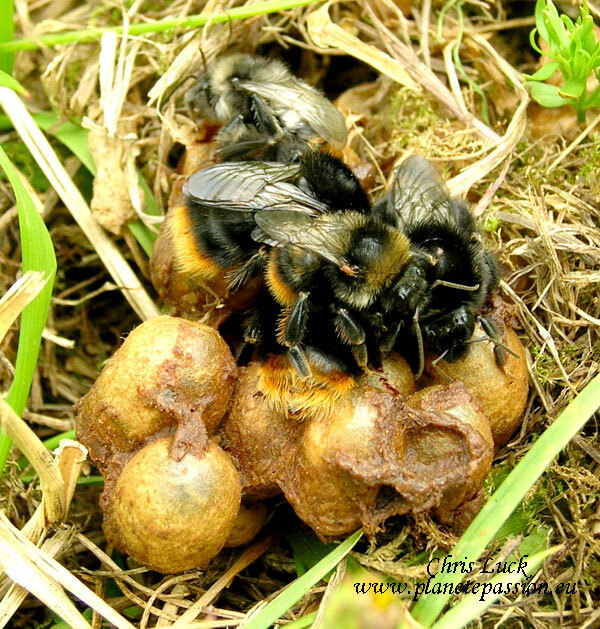 Following this initial stage in the life of the colony the method of production falls into two possible methods as follows - Pocket-making bumblebees create pockets of pollen at the base of the brood-cell clump from which the larvae feed themselves. Pollen-storing bumblebees keep pollen in separate wax pots which the adult bees feed to the larvae. The colony grows progressively larger and eventually begins to produce males and new queens. 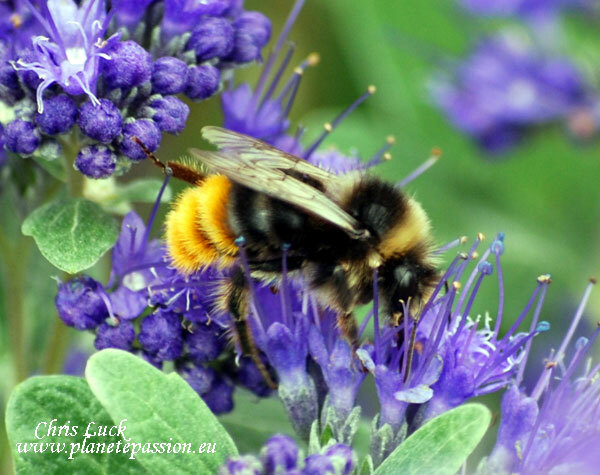 The workers of Bumble bees are fertile and can lay unfertilised haploid eggs that develop into viable male bumblebees. Only fertilised queens can lay diploid eggs (one set of chromosomes from a drone, one from the queen) that mature into workers and new queens. At some point in the colonies development they start producing new Queens and males. Generally the males leave the nest and do not return as they have no other function than to mate with any and as many new Queens that they can find and only require enough nectar from flowers to keep them going. The new Queens leave the nests a little later than the males to be mated as it’s important the males are ready and waiting. Typical mating behaviour will involve several males competing in one way or another. Once the new queens have mated they need a good supply of pollen and nectar to provide enough body weight to get through the long winter hibernation. The old queen and the colony will slowly die out towards the end of summer but the timing of this also varies according to species and weather conditions. Stage 1, the queen emerges from hibernation and starts new colony by herself. Stage 2, workers (females) are produced and start to forage; the colony develops and grows. Stage 3, unfertilised eggs (males) are laid and worker larva develop into new queens. Stage 4, males and new queens mate, the colony disintegrates, the old queen, workers and males die, and new queens hibernate. 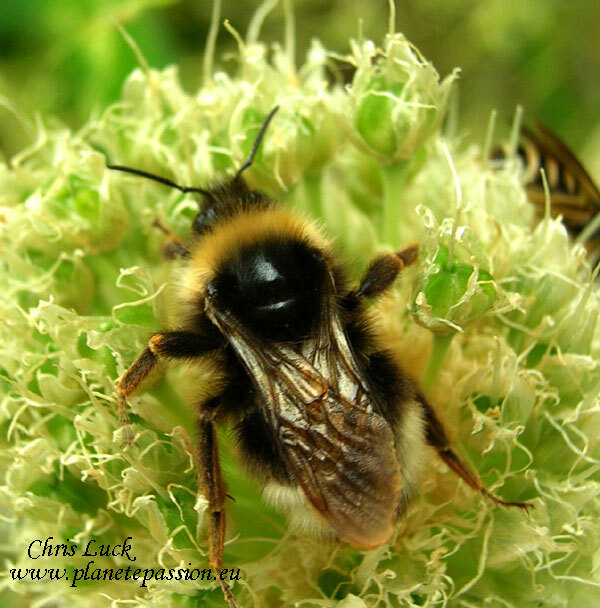 The average size of Bumblebee colonies varies according to the species; some may be comprised of several hundred bees and others as few as thirty or forty and colonies rarely live longer than a few months. For the great majority of species, workers and queens have nearly identical colour patterns, males however do display different markings. Workers are effectively smaller copies of Queens, half size in some cases and Males are usually somewhere between the two in size. 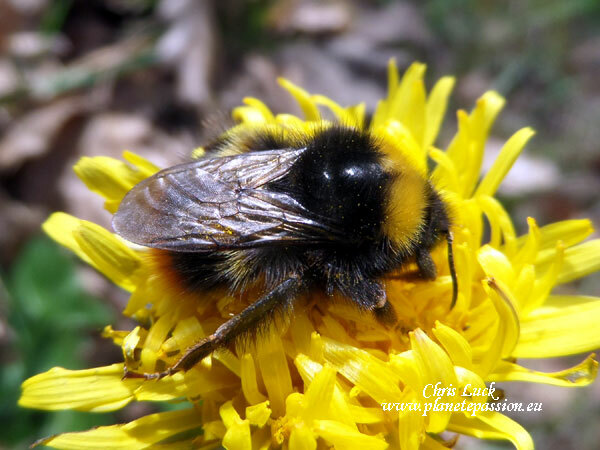 Cuckoo Bumble bees lay their eggs in “regular” Bumble bee nests and then leave the workers of that nest to rear them. The Cuckoo female does this by sneaking into the nest and picking up the nest scent which then allows her to move around freely. Should they need to fight and kill the existing Queen they will invariably succeed as they have no wax glands between the bands in their abdomen which is where stings can easily penetrate. Once the Cuckoo eggs hatch it effectively means the end of the colony as the larvae and adult bees of the Cuckoo simply consume valuable stores without contributing to the provision of the nest. As there is no requirement for workers Cuckoo bees are only males or females, there is no one Queen as such. Once the males and females leave the nest and mate the females simply feed up on pollen and nectar to maintain themselves and provide for hibernation until the following year. We must remind ourselves that Cuckoo species are also native bees and have evolved alongside the species they take advantage of. 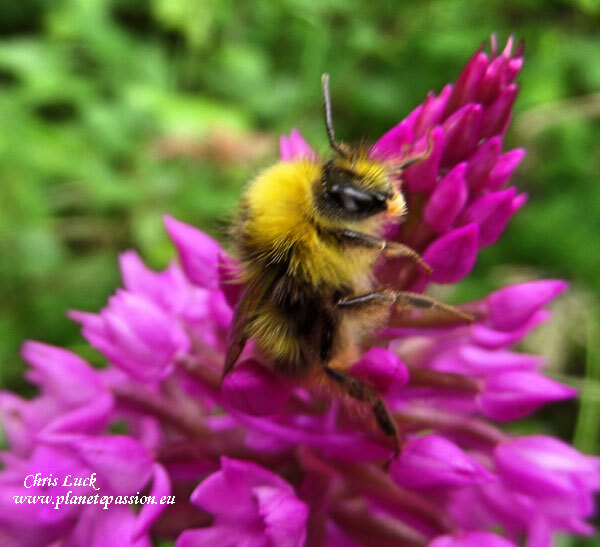 ABOVE: Common Carder Bee, (Bombus pascuorum), French name - le bourdon des champs. 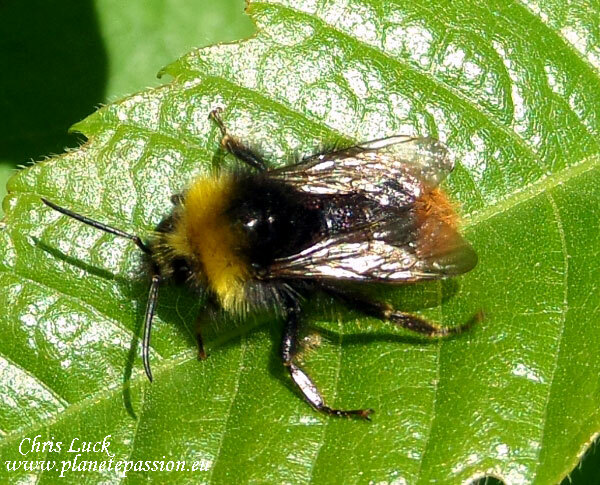 ABOVE: Tree Bumblebee, (Bombus hypnorum). 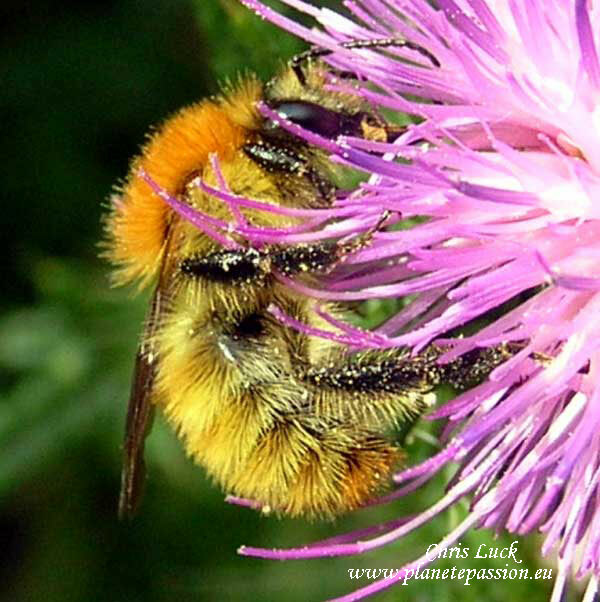 ABOVE: Forest cuckoo bumblebee,(Bombus "Psithyrus" sylvestris). ABOVE: Male Early Bumble bee, (Bombus pratorum). ABOVE: Worker Early Bumble bee, (Bombus pratorum).